Our West Liberty IA and Muscatine IA dental offices see a lot of children and their parents. We love treating families with our elite services and advanced technology. Our soothing dental team enjoys sitting down with patients to help them with their at-home dental care. Today we want to share a few things about your child’s dental needs. Children go through a number of dental changes in their lives, and parents need to know how to respond to these situations. 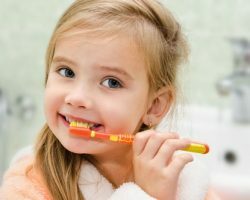 We offer pediatric dentistry, and today we want to highlight some things to expect when it comes to your children’s teeth. Every person will have 20 primary teeth, also known as baby teeth. These teeth begin erupting without the first few months of their life. Teeth erupt at different rates, and infants often experience fussiness or running noses. The final primary teeth to erupt are typically the two-year molars, which erupt around the time the child is two, though sometimes it’s later. For more than 35 years, Dr. Moreno has recommended that patients begin bringing children to the dentist by the age of 1. This helps make the child more comfortable with the dentist and to help that child avoid extensive dental treatments at a young age. Patients should begin cleaning their child’s teeth as soon as the teeth erupt. We recommend a fluoride-based toothpaste as your child gets older. In our office, we also use additional preventive measures like dental sealants and fluoride treatments to reduce the risk of tooth decay. It’s a big step for children to lose their baby teeth. Most children are excited to lose their baby teeth, and we encourage our parents to reward children every time their child loses a tooth. You can plan a visit from the Tooth Fairy or celebrate in your own way. Whatever the case, it’s important to make the experience positive. The first baby teeth to dislodge are often near the front of the mouth. Loose baby teeth will wiggle or even bleed a little. It’s best to let the tooth dislodge naturally and refrain from tugging on or rotating the tooth. Baby teeth serve as placeholders for the permanent tooth. Baby teeth often begin to fall out whenever the child is about 7, and the process takes years. If the baby teeth do not fall out on schedule, we might remove them to make space for the adult teeth. Removing baby teeth or placing space maintainers in the mouth can help teeth erupt straight to minimize or even eliminate the need for orthodontics down the road. That’s great for your child and for your budget. Gentle Family Dentists wants to serve your entire family. It’s our mission to give children a care-free, fun visit to the dentist so they aren’t afraid to walk into dental offices when they’re older. Schedule a visit with our dental team now by calling 563-288-2612 or using the online form to request a visit.